&bull; Brand: Sukkhi &bull; Product Type: Rakhi &bull; SKU: 142RAKHI2CB650_Y16_HD &bull; Colour: White and Golden &bull; Material: Alloy &bull; Plating: Gold Plated &bull; Stone Used: Cubic Zirconia &bull; Design: CAD/CAM &bull; Dimension: L: 2 cm||B: 1 cm||Weight: 20 gms &bull; Description: This combo includes a Cartoon Character shaped pendant multipurpose rakhi. Package includes 2 Rakhi. 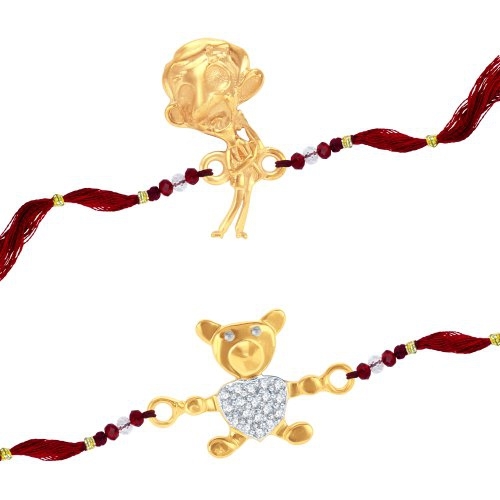 This lovely Cartoon Character Rakhi, brought to you by the well-known fashion jewellery brand Sukkhi. With the auspicious occasion of Rakhi just round the corner, this rakhi will be an ideal gift for Kids. Made of alloy, the rakhi has a creatively crafted Cartoon Character which is given a fine gold and rhodium plating. The rakhi is studded with shimmering cubic zirconia stones, which makes it all the more shiny and bright. &bull; Care label: Avoid of contact with water and organic chemicals i.e. perfume sprays. Avoid using velvet boxes, and pack them in airtight boxes. After use , wipe the jewellery with soft cotton cloth. &bull; Note: The image has been enlarge for better viewing. &bull; Disclaimer: Product colour may slightly very due to photographic lighting source or your monitor settings.